The countryside around Lucca is an enduring testimonial to the hedonistic lifestyle of Lucca’s noble families who between the fifteenth and nineteenth centuries built over three hundred patrician country residences on the gentle hillsides which surround the city. This villa landscape is famous all over the world. The elegant Villa Spada in Orbicciano built in the 1700’s with its surrounding farmhouses is the epitome of this elegant country house era. Set high in the hills twenty minutes north west of Lucca with breath-taking panoramic views on every side, it was once a hunting lodge belonging to the aristocratic Spada family. The Orbicciano estate, which produces some of the finest olive oil in the region, also includes a farmhouse which are available for holiday rentals. 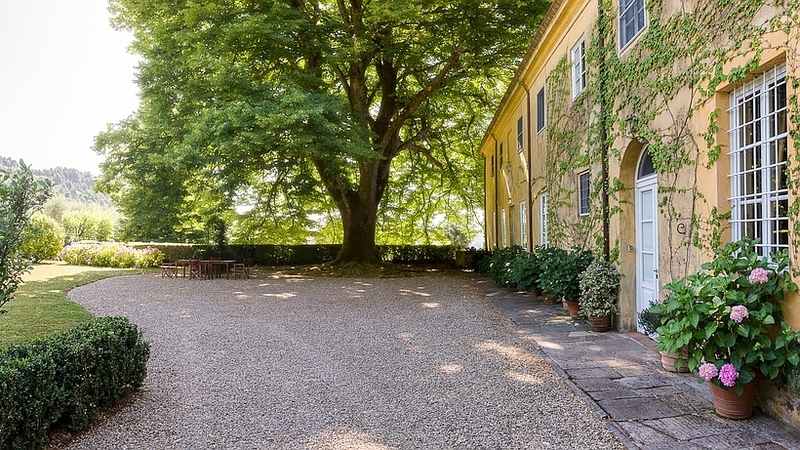 The estate of Orbicciano lies outside Lucca, one of Tuscany’s most sought after spots. Many films have been made in this area. Life in the small hamlet of Orbicciano has a fascination all its own, even attracting an American artist to set up house and her easel here. There is a small trattoria just down the road, while all around are other country villages, each with a different patron saint who is feted on a different day of the year with pageants and supper and dancing under the stars and fireworks lighting up the sky behind the next hill. This is a very fertile part of Tuscany with a patchwork of fields changing colour with the seasons, while the trees all stay the same, the dark green of the cypresses, the silvery olives and the holm oaks that never lose their leaves, all year round. Lucca, Pisa and Florence are within easy reach of Orbicciano. The famous villas of Lucca, the Versilian beaches and the Apuan mountains with their spectacular marble quarries are all just a few kilometres away. You can go cycling, play tennis and golf or relax in the spas in Bagni di Lucca or the beauty Farms in Vico Pisano and Montecatini. Isabella Spada, the owner and manager, will be here to welcome you and to offer suggestions and ideas to help you decide what to do and to make your stay more enjoyable. The estate Orbicciano is at 15-20 minute drive from Lucca and 25 minutes by car from the sea. Lucca: Twenty minutes away from Orbicciano by car, Lucca is one of the most enchanting towns in Tuscany – strolling along the wide avenues along the top of the ancient city walls or in the narrow streets with their ninety nine churches, browsing among the old-fashioned little boutiques, sipping a cappuccino at one of the many bars, tasting the best ice-cream, visiting the richly endowed museums – is a sheer delight. Sightseeing: Pisa is at twenty kilometres, Florence at 80 and Siena at 120. The small sculptors town Pietrasanta, just below the marble caves where the famous white carrara marble comes from (a fascinating excursion) is twenty minutes away. The seaside: There are sandy beaches approximately thirty minutes away on the coast of Versilia at Viareggio and the fashionable Forte dei Marmi with lively bars, designer shopping and some of the best seafood restaurants in Italy. Tennis courts are to be found 15 km from Villa Spada in the village of San Concordio di Moriano. Riding in the neighbour village San Martino in Freddana (5 km).